On Tuesday Nigerian singer and award winning artist Ayo Balogun aka Wizkid turns 24. 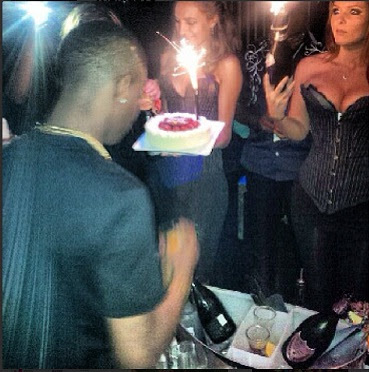 After receiving a surprise birthday gift from his girlfriend, Tania Omotayo, Wizkid catch the fun of his life during a night party organized by friends and colleagues. The singer also tasted world’s most expensive champagne by controversial Nigerian luxury designer Alexander Amosu. Contrary to the story making round that Wizkid bought it, we learnt he just had a taste of Alexander Amosu’s world most expensive champagne, Goutdediamants. The guy pouring the wine for Wizzy is Liam of One Direction.